2. After 90 minutes, remove the pressure cooker from the heat and allow to cool completely before removing the lid. Allow the short ribs to cool in the liquid. Place some of the barbecue sauce on 4 pieces of clingfilm and place the short ribs in the centre. Add a little more barbecue sauce and wrap each short rib tightly. Place the wrapped ribs on a tray and keep in the fridge for a minimum of 12 hours or overnight, and for a maximum of 2 days. 3. Just before serving, unwrap the ribs and place on a hot barbecue for 4-5 minutes to reheat. Baste with the barbecue sauce on all sides. 4. 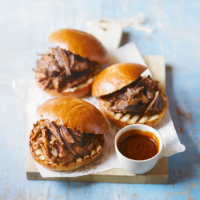 Shred the meat from the bone, mix with a little more barbecue sauce and serve in the brioche burger buns with sauce on the side. If you don’t have a pressure cooker: prepare as in step 1 and place in an ovenproof casserole dish, cover and bake in a preheated 170°C, gas mark 3 oven for 3 hours. This recipe was first published in Tue Aug 04 16:50:00 BST 2015.